While looking for a different image I ran across this one and had to make it. I don't remember where I saw it. I'm usually pretty good at keeping track of my footprints on the net but sometimes I just get lost! So if you know the original designer of this card, please let me know so I can give the person the credit they are due. Note: edited 11-13-13 The original card can be found here at Sleepy in Seattle. 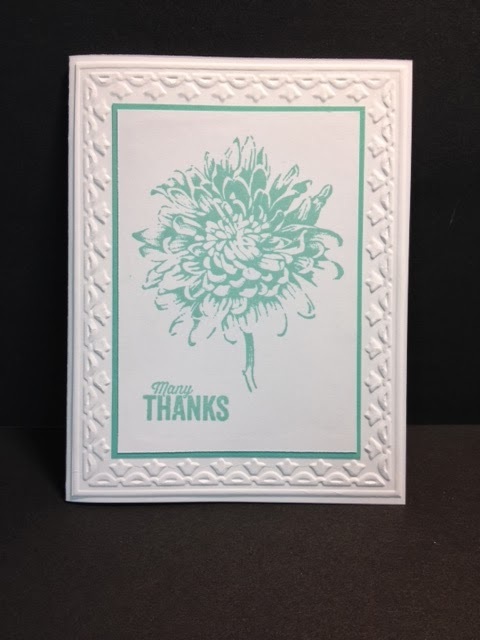 This is a super simple card. It takes one sheet of Whisper White card stock and a piece of colored card stock. On mine I used Coastal Cabana and Coastal Cabana ink. I cut my card stock in half and folded one of the pieces in half. Then I cut the other piece in half and embossed it using the "Framed Tulips" folder. Then I trimmed the paper close to the outer embossed frame on it. I cut my Coastal Cabana piece 3-1/8" x 4-3/8". I cut my white piece 3" x 4-1/4". I stamped the image and then the words. And that was it. Extremely simple and ever so quick!!! I am thinking about making some gift packs of birthday cards using this image. It's perfect for that and pretty too!